Yesterday the TUC launched its Britain needs a pay rise campaign. We published research showing that, in real terms, Britain’s total pay packet has fallen by over £50bn since the end of 2007. The Guardian provided a good write up of the key findings. There is no doubt that the last few years have been tough for most people. Real wages have been falling since early 2010 and nominal pay growth is now at its weakest level since at least 2001. Although the pain is not being equally shared, with data out yesterday showing that the pay packet of the FTSE Chief Executives rose by an average of 10% in 2012 (£). The response of some commentators when faced with these facts is to assume that it is nothing new. On twitter the Economist’s Daniel Knowles asked if this was not just evidence that the economy was not growing? Obviously this a fair point – the economy has been doing badly and this has impacted on the earnings of most people. Two weeks ago the IoS’s John Rentoul expressed a similar point of view. I’m afraid that is not true. I wish it were so, for if it were simply a case that the recession had hit people’s incomes then the solution would be relatively straight forward – boost demand, restore growth and enjoy the fruits of that growth. By using a mean measure of expenditure per head somewhat misses the point. First the debate is really around incomes not expenditure – expenditure running ahead of incomes and the resulting build up of personal debt was a major factor contributing to the crash. (The key IMF paper on this is well worth a read, and one of its authors is speaking at the TUC next month). But more crucially Rentoul has used a mean when we should be using a median. Imagine if we had an economy with only ten people who all earned £25,000 a year and one year one of them saw their income increase to £250,000. Mean income per head would increase to £47,500 – a fairly staggering increase – but 9 out of 10 people would see no rise in their income level. Using a mean in this example would give a highly misleading picture. The Resolution Foundation’s Commission on Living Standards looked at the data in detail. It found that from 2003 to 2008 median wages flat-lined, average disposable incomes fell in every English region outside London and spikes in the prices of essential goods squeezed family budgets. Millions of households are heading for a long period of stagnant living standards unless bold steps are taken to ensure that growth over the next decade is broadly shared. Even with a return to steady growth, it’s now entirely possible living standards for a large swath of low and middle households will be no higher by 2020 than they were in 2000. In other words, something was going wrong before the crash. The striking falls in real wages over the past three years, follow on from a period in which for many people their pay packet had simply stopped growing. This was driven by two major factors – an increasing proportion of the wage growth that there was being taken by those at the top and a fall in the overall share of the economy being paid out in wages over a three decade period. On this second point I’d highly recommend a recent TUC Touchstone publication. By coincidence, Gavyn Davies has been writing about the same issues over at the FT’s own blog today. If we accept that what is happening to wages right now is not simply the result of the recent recession (and the evidence certainly suggests this) then the current debate about around macroeconomic policy has to move beyond how we simply return to growth and into questions about how we ensure that any growth we do get actually benefits most people. Some of the answers are the subject of a forthcoming Touchstone pamphlet but they involve not just action to push up wages but also policies aimed at making sure our economy generates better paying jobs in the first place. This policy debate takes us away from the traditional levers of macro policy and into a broader discussion about reforming our national business model. A longer version of this blogpost is here. Duncan is a regular contributor. He has worked as an economist at the Bank of England, in fund management and at the Labour Party. He is a Senior Policy Officer at the TUC’s Economic and Social Affairs Department. Will you *please* stop talking about the economy as if it divides neatly into profit share and wages share. It doesn’t as you know. 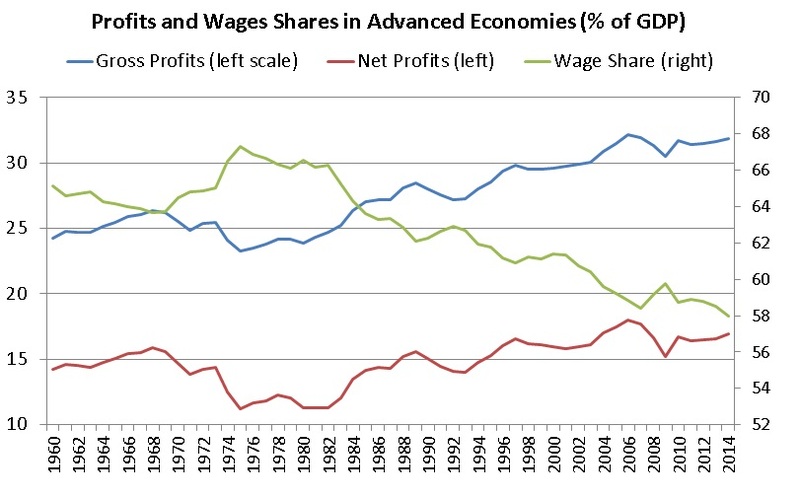 As above 34 % (or so) gross profit share plus 58% wages share does not add up to 100% of the economy. There’s a least one other bit to go there: taxes minus subsidies on consumption. And given that VAT has risen substantially over the decades that will be becoming a larger part of the economy. It might even be partly a rise in the profit share is causing a fall in the wages share. But without looking at all of the components in national income we’ll not know, will we? And do note about. The fall in hte labour share has been greater than the rise in hte net profits share. So clearly something else is happening, no? And wouldn’t it be wonderful if professional economists working for the “public good” tried to tell us what that is? Don’t we all (apparently) want to be more like Germany? This, from Mr. ‘taxation is a constant sum game’. You really are shameless Timothy. Wages as a proportion of GDP have been falling steadily since the 1970s, as income inequality has risen. Tax is irrelevant to this, the issue is the board taking an ever larger slice of the cake than the shop floor. Similarly, real wages have not moved since the 1970s, something that has been masked by the growth of 2 income household in the same period. It is one of the factors driving many away from employment in hierarchical private sector organisations and towards self-employment.